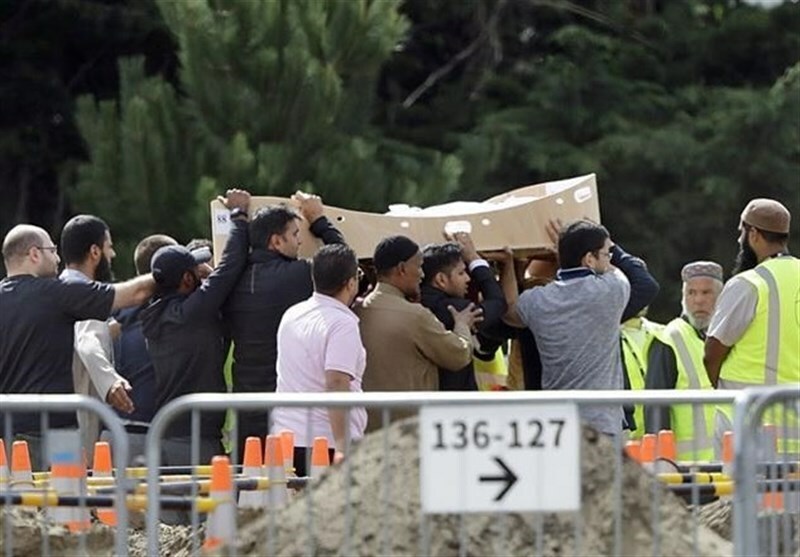 TEHRAN (Tasnim) - Families of the Christchurch mosque attack victims began burying their relatives five days after 50 people were killed in the worst mass shooting in New Zealand's history. At least five victims were laid to rest on Wednesday at the Memorial Park Cemetery, following the release of the bodies from the coroner's office a day earlier. Among those being buried were a 15-year-old Syrian refugee Hamza Mustafa and his father, Khalid, 44. They had just arrived in New Zealand six months before they were killed. Hamza's younger brother Zaid, 13, suffered gunshot wounds to the leg in the attack. He was seen being pushed around in a wheelchair during the ceremony. Junaid Ismail, 36, and Ashraf Ali, 58, were buried in seperate ceremonies later on Wednesday. The fifth buried victim's name could not be reported. Many mourners lined up to help fill the graves with soil by hand as the bodies were laid to rest, with people asked to refrain from using shovels in order to ensure all those wishing to take part could do so. The burials come after police earlier named five of the victims of Friday's attack on the Al Noor and Linwood mosques. Three-year-old Muccad Ibrahim was among those confirmed killed in the massacre, which Prime Minister Jacinda Ardern has branded a "well-planned terrorist attack". Mourners described the emotional anguish experienced by all those at Wednesday's ceremony. "Everybody is grieving in a way that we can't explain," Gulshad Ali, who travelled from Auckland to attend the burial, told Al Jazeera. "I feel devastated, I am emotionally disturbed seeing the bodies laid down." Mohamed Aljibaly, an imam at the Australian Islamic Centre who travelled to attend, noted how the family fled the horrific eight-year war in Syria only to be killed in New Zealand - one of the world's most peaceful nations. "These were a father and a son. He was a Syrian brother and he escaped what is happening in Syria every day, and the massacres that are happening there nearly daily, to pass away in New Zealand, the place that he thought to be his new home because he was a refugee," said Aljibaly. Mustafa Ibrahim said he had never before attended such a solemn event. "It just feels like we have put to rest incomplete life," Ibrahim told Al Jazeera, citing the killing of the Syrian teen Hamza. "I am a father, I also have a son. It's so hard to come here and pray and bury two people. But we will come here again until all of them [the victims] are buried." Prime Minister Ardern said she was devastated by the news that the Mustafas from Syria had been killed when being briefed on the "atrocious" events as they unfolded on Friday. "I cannot tell you how gutting it is to know that the family came here for safety and for refuge, and they should have been safe here… This was their home," Ardern told Al Jazeera during a press conference at Christchurch Central police station. The New Zealand leader earlier visited Christchurch's Cashmere High School, where Hamza had studied. "I need to hear the grief, [and] I feel the grief," she said. Police said in a statement the bodies of 27 victims would be identified by midday on Wednesday and would be available to their families for burial. Ardern said at the press conference later on Wednesday that 30 victims' bodies had been approved for release. There's been growing anguish over a lack of progress by officials tasked with identifying the dead. Muslims customarily bury the deceased within 24 hours of death. Before their burial, the bodies are washed and wrapped in a white shroud so that funeral prayers can be conducted. However, authorities say they need to be 100 percent certain of the identification process so the wrong body isn't returned to a victim's family, and evidence can be used in court against the murder suspect. "It would be unforgivable to return the wrong body to a family," Police Commissioner Mike Bush said in a statement on Wednesday. "I want to again reassure you that we are working relentlessly, doing everything in our power, to complete the formal identification processes as quickly as possible." Ardern, meanwhile, said she understood the "frustration" of families still waiting to bury their relatives, adding there were "lessons to learn" from how authorities had dealt with the issue so far. "Many processes we have are based on circumstances very different to this one… In the aftermath I will want to reflect on this and want to improve," she said at the press conference. Christchurch Hospital said 29 people wounded in the attacks were still receiving medical treatment. Eight remain in critical condition. A four-year-old girl being treated in the Starship Hospital in Auckland also remains in critical condition, the statement added. "We are gearing all available theatres to follow-up acute surgery, which means we will be continuing to postpone planned surgeries," said David Meates, chief executive of Canterbury District Health Board. "People injured in the mosque attacks are still our priority for surgery." Australian Brenton Tarrant, a white supremacist, is accused of carrying out the massacre with modified semi-automatic weapons. He will appear in a Christchurch court on April 5. Bush said on Wednesday that police officers had rammed Tarrant's vehicle and apprehended him 21 minutes after the first emergency calls were received. Previously, police had said it took 36 minutes. Ardern has promised to amend New Zealand's gun laws in the wake of Friday's attack.